Looking for a cheap and effective alternative to store bought scrubs? This DIY baking soda face scrub works just as well as any other facial scrub, but it will literally cost you pennies! The small granules in baking soda help with exfoliation, all the while removing dirt, impurities, build up, and blackheads. 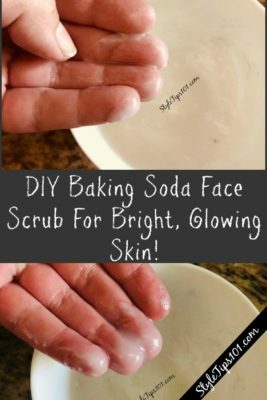 To make this baking soda face scrub even better, we like to add a little bit of coconut oil which will make this scrub less abrasive, add hydration, and make skin glowing! Apply to wet skin and scrub in slow, circular motions.